With fans flocking to get his autograph, a beaming Pieter said: “It is an unbelievable show here. We went last, which is always a good position to go, and it was a fast jump-off with a big ring with long galloping lines. I felt [Claire was] fast in Doha, and I thought I’d try let her go and I’m really together with her now. 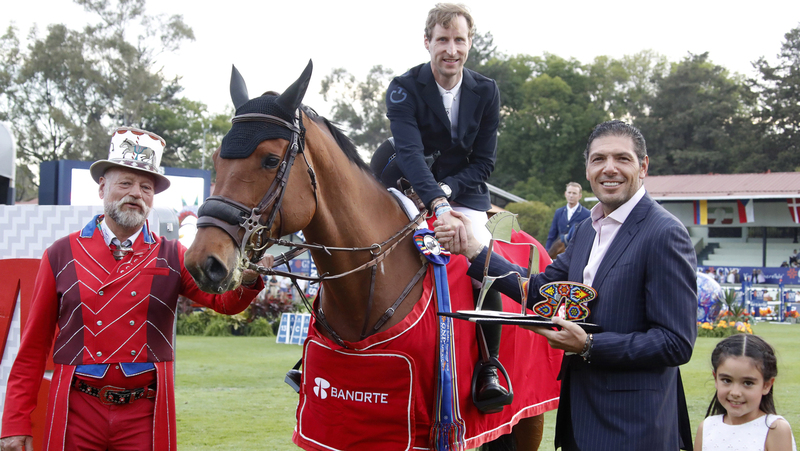 The penultimate day of the Longines Global Champions Tour of Mexico City came to a close with many of the top names in showjumping battling it out to win the Banorte Trophy. With €146.000 in the prize pot, everyone was aiming to land on top of the podium. The footing in this arena is some of the best in the world, Jos Verlooy praised the ground; “It doesn’t get better that what is here, no matter where you jump in the class the going is perfect." Beezie Madden (USA) claimed the sixth spot in the jump-off with her famous horse Coach and Jerome Guery became the second Belgian to go through on Quel Homme de Hus. As the shadows lengthened across the arena, nine would return to try their luck for the jump-off. Niels Bruynseels (BEL) looked quick from the off with Utamaro D Ecaussines, but a turn too wide to the Banorte double of verticals kept them behind Peder in 42.41s. Jerome Guery (BEL) and Quel Homme de Hus bounced off the foot-perfect grass arena, the careful horse gaining plenty of air over the tough courses. Another powerful gallop to the final fence couldn’t make up their time and they would stop the clock in 41.95s.